The universal Catholic Church is celebrating the centenary of the apparitions of our Lady at Fatima. The devotion to our Lady of Fatima has a special place among Macau Catholics. 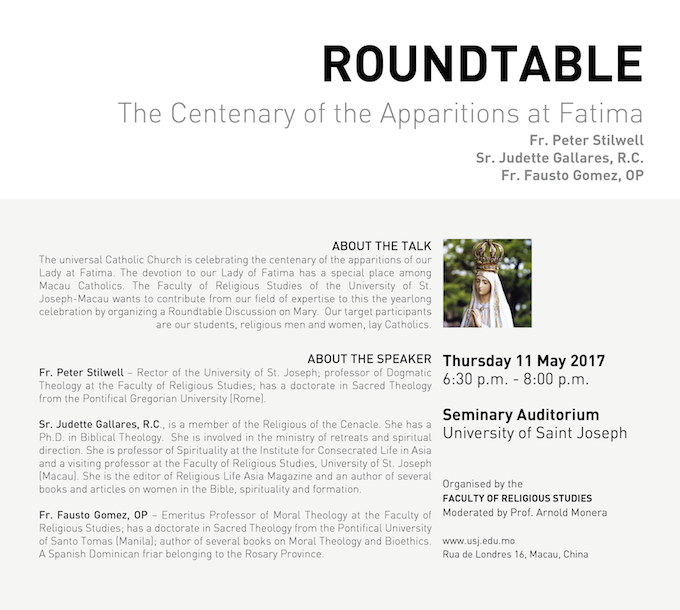 The Faculty of Religious Studies of the University of St. Joseph-Macau wants to contribute from our field of expertise to this the yearlong celebration by organizing a Roundtable Discussion on Mary. Our target participants are our students, religious men and women, lay Catholics. Peter Stilwell – Rector of the University of St. Joseph; professor of Dogmatic Theology at the Faculty of Religious Studies; has a doctorate in Sacred Theology from the Pontifical Gregorian University (Rome). Judette Gallares, R.C., is a member of the Religious of the Cenacle. She has a Ph.D. in Biblical Theology. She is involved in the ministry of retreats and spiritual direction. She is professor of Spirituality at the Institute for Consecrated Life in Asia and a visiting professor at the Faculty of Religious Studies, University of St. Joseph (Macau). She is the editor of Religious Life Asia Magazine and an author of several books and articles on women in the Bible, spirituality and formation. Fausto Gomez, OP – Emeritus Professor of Moral Theology at the Faculty of Religious Studies; has a doctorate in Sacred Theology from the Pontifical University of Santo Tomas (Manila); author of several books on Moral Theology and Bioethics. A Spanish Dominican friar belonging to the Rosary Province.